For more detailed info, see our longer version of this article on Two Rep Cave that goes over why olympic weights are the best, why you might use standard weights, and what to watch out for with some plates marked Standard. Standard bars are exactly 1" in diameter throughout the whole length (besides the shoulders that stop the weight plates). They are made to take standard weight plates. Standard bars weigh 13 to 19 lbs or so. That's for solid steel ones. Special "cardio" bars are hollow, only 5 lbs, and are not meant to take much weight. 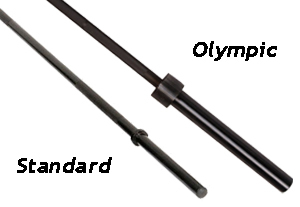 Olympic bars are just short of 2" diameter on the ends (actually 1 31/32", or 50mm). As such, they will only take olympic weight plates, which have 2" diameter holes. These actually can also be divided up into olympic weightlifting and powerlifting bars, or even further, but they are often just called olympic bars. Olympic 7ft bars are supposed to weight 45 lbs or 44 lbs (20kg). There are cheaper 7ft bars that weigh less. Shorter olympic bars, 5ft or 6ft, may weigh as little as 29 lbs. "Technique" bars are hollow or aluminum and a good choice for sticking with olympic weights but at a low starting weight as low as 10 lbs. Typical standard plates are the "pancake" shaped plates with rounded edges, consisting of these sizes: 1.25lb, 2.5lb, 5lb, 10lb, 12.5lb, 20lb, 25lb, 50lb. The holes are just over 1" diameter to fit on a standard bar.